Occupational therapists understand the need for a good balance between life activities, but can still struggle with practicing it themselves. This can be especially true for occupational therapists who are caregivers. It is not an unusual situation to care for an ill loved one but it certainly is a weight to carry, especially through the trying times of graduate school and/or through your working career. Despite the wealth of knowledge you possess, you may struggle with how you can best promote quality-of-life for an ill loved one, what resources or supports to use first, and how to practice caregiver self-care in a time such as this. When I first encountered OT, I was contemplating switching majors, and simultaneously helping care for my grandfather who was in a SNF just after his TKR. He was working with both PT and OT, and I learned of the field from his therapists. This made me appreciate the perspective an OT has towards personal caregiving responsibilities, which can be both a pro and a con. OTs may instinctively immerse themselves in caregiving responsibilities; however, our profession may give us insight into what our loved one needs. While following the tips below can assist an OT who is a caregiver, it cannot be stressed enough how important it is to ensure the two aspects of your life do not bleed into one another. This is truly the only way to ensure you are giving both yourself and your loved one what is needed. This aspect of caregiving cannot be stressed enough, which is why it is mentioned before all others. 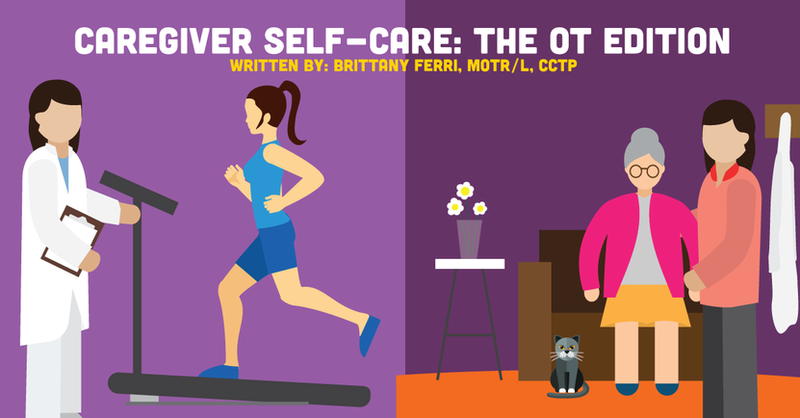 In school, OTs learn about personal self-care so much it becomes redundant. But it becomes very difficult to put this into practice (quite literally) once you get your first job. Therapists can often become so consumed with helping others that it may unconsciously spill over into your personal life and, before you know it, you find yourself burning out and wondering where you went wrong. This is advice OTs with any level of commitment should listen to. This article is specifically tailored to assisting you with self-care if you find yourself burning out within your job. Above all, it is important for OTs to practice what they preach; preferably before noticing too many warning signs! More specifically in terms of OT caregivers — don't forget to ask for help if you need it. As OTs, we tend to want to take it all on, especially when caring for someone so close to us. There is no shame in calling in reinforcements to save yourself quite a bit of stress, time, and energy. By monitoring your own symptoms, you can ensure you aren't getting too burned out. Increased irritability, inability to enjoy yourself during down time, dealing with the common cold frequently, difficulty sleeping, and struggling to manage all your work, school, and home responsibilities are all signs you may be heading towards disaster. Be sure to seek help as needed, whether it be counseling, a monthly spa day, spending time in nature, shutting off all electronics for a period each day to meditate or pray, talking to a friend, heading to the gym or a yoga class, or reading a book. Anything that brings you a few moments of relief before heading back to your responsibilities. If you're finding it difficult to maintain your own physical health amongst all your growing responsibilities, you may want to analyze your current habits, such as time management, sleep schedules, and exercise. Whether you are a partial or sole caregiver, whether the affliction is a chronic or acute illness, understanding your loved one’s illness will be important to helping them. As we know from our daily work, research skills start in school and continue through your working career. The medical world is full of diagnoses, not all of which we have learned in school. Research continues to be important to knowing how we can best help those around us. Ensuring we know the prognosis of the condition will help us help our loved one when they need it most. In this way, we can be more knowledgeable when speaking with members of your loved one's treatment team, suggest interventions we've heard of through our training, and help modify certain tasks or the environment to soften the burden on your loved one's mind and body. This can help your loved one save time and energy to focus on things more important to them. Take a day or a couple of hours out of the week to spend time with your loved one doing something they want to do, rather than something they have to do (doctor’s appointments, trips to the pharmacy, and more). This will help relieve stress for both of you; knowing things don’t have to be so busy when you are together. What do they want to do? What have they not had time for since their illness? Maybe visiting a park you both used to frequent during the spring, or kick-starting a traditional Sunday dinner like the family used to do. Anything that will bring back good memories of carefree times and of spending unobstructed time together. Maybe this will entail buying holiday or birthday cards and helping your loved one write them out to send to the family , or cooking for their spouse. It may include responsibilities towards young siblings, such as driving to and from school and extracurricular activities or helping with homework. This could mean ensuring the appropriate accommodations are in order at their job if they are currently there, or providing your loved one’s employer with sufficient medical documentation to ensure disability funds continue. Of course, it is important to note that it is difficult to maintain all role responsibilities in the wake of most illnesses. However, any assistance in helping your loved one maintain parts of a role that they value will serve to maintain quality of life and improve their role satisfaction. By potentially decreasing stress, this may benefit their physical health -- if their illness primarily affects the body -- as there is a strong connection between physical and emotional wellness. If your loved one’s illness is psychosocial in nature, role engagement can mitigate depressive symptoms, improve their orientation to reality, and improve interpersonal relations. First and foremost, you must follow your own self-care plan and continuously monitor your own physical and emotional health. As many have said, it is extremely difficult to care for someone else if you are dealing with many personal struggles. Though this is harder to do than to say, it is a sound idea to check in with yourself frequently. This can be as frequently as each time you re-enter your caregiving role to maintain a good level of awareness with your needs. This is a good practice for anyone involved in a large, energy-consuming activity as well as anyone with difficulty managing stress. Whether you are new in your OT career or a bit more seasoned therapist, you will likely have resources that come along with your skill set. This can include virtual resources, such as sites with blog posts, Facebook groups with many people dealing with the same or similar situations, and sites that provide diagnosis-specific tips for helping loved ones. For example, caregivers for those with Alzheimer’s disease can check out the Alzheimer’s Foundation of America for resources. Similar foundations are Relay for Life (for those with cancer), Juvenile Diabetes Research Foundation (for Type I diabetes), National Association for Mental Illness (for chronic mental illness), and Multiple Sclerosis Foundation (for Multiple Sclerosis). A quick internet search can get you in contact with the websites for these organizations, which can provide grant information, education, fundraising opportunities, and contacts for their local chapters. Additionally, you can refer your loved one to an in-person support group to assist with the emotional component of illness, or find a support group for caregivers where you can network.and find how other caregivers are coping with their responsibilities. In some instances, it may be helpful to contact a case manager or an attorney to assist with legal aspects, if the illness is terminal or so debilitating that your loved one needs more intensive assistance with finances, assets, and/or medical decisions. If you are a sole caregiver and your loved one has an involved illness requiring nearly 24-hour care, it may be worthwhile to research respite programs to assist with caregiving while you fulfill work, school, or family obligations. There is often financial assistance for such programs for those who are in need of it. This page provides a list recommending blogs and groups on several different areas of OT. Check in regularly for continuous updates and advice from other OTs, who manage these sites and can assist others in providing resources for your loved one. There are many areas of overlap for when an OT is dealing with chronic illness personally, though your own self-care cannot be stressed enough in both instances. It is important to recognize the distinction between being a caregiver for an ill loved one and dealing with it personally in addition to OT responsibilities. Check in with NGOT soon for an article to assist OTs who are coping with their own chronic illness. Do you have any additional tips on being an OT caregiver? Are you currently juggling being an OT or an OT student with a caregiving role? Let us know in the comments!